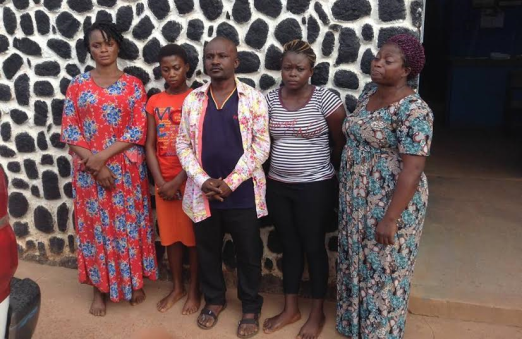 A notorious suspected fake prophecy syndicate that specialized in working with some owners of religious ministry to confirm a certain prophecy in order to win more members for ministries and churches were on 19th August and 20th August 2016 nabbed at Holy Ghost park axis and popular P&T axis of the state by the operatives of the central police station of the Enugu state police command of the Nigeria police Force. According to statement issued today August 21, by the Command, the suspects identified as Obi Ejike from Ubaho Okija in Ihiala local Government Area of Anambra state, Kuku Mary from Ijebuode Ogun state, Oluwakemi Joy from Ojo Lagos State, Nwosu Chizoba from Umunze in Anambra state and Peter Uchechi from Ebonyi state were nabbed on their way to a church/Ministry in Abakiliki and in Enugu to join in the fake prophecy deal. It was further gathered that luck ran out of the syndicate as confusion broke out at a bus stop between them leading to some arguments and consequently attracted the attention of security operatives very close to the arena who suspected the scenario and intervened and on instant inquiry,the duo of Obi Ejike and Oluwakemi Joy were speaking at variance but further interrogation conducted immediately revealed that they are in for nefarious activities and eventually the other group billed for Abakiliki church/ministry prophecy were trailed and nabbed at P&T bus stop while waiting for bus to Abakiliki. One of the suspects Peter Uchechi(F) maintained that they were recruited in large numbers and kept in house at Onitsha, Anambra state from there they shuttle to various states of the country to confirm a prophecy for the purpose of winning more souls for the said church or ministry and that they are usually paid through their coordinator who hired the house and kept them there. According to her, they can be detailed to go to any state but the number of the link man in the said church/ministry is usually provided to them for easy connectivity on arrival and that they usually dialogue with the link man to the pastor of the church/ministry on the shape the job will take. She went ahead to reveal that they usually state their names,nature of problem they have and other necessary information which is given to the pastor of the church/ministry for his guidance and during the prophetic hours,she will be among the people with the said problem that will come out. The pastor then using the said information prophecy and she confirms that before the congregation and she will be touched and she will fall and the pastor proclaims the problem is all over and that she has received her healing and that way,members of the congregation will believe that the pastor is powerful and a man of God and this will attract more members to the church. "Some Pastors use us to grow their church/ministry and we are paid later through our coordinator depending your role." concludes Uchechi. On his part, Obi Ejike confirmed their illicit deal and maintained that he works hand in hand with the coordinator and he is the link of the people for Abakiliki and Enugu Job. He maintained that he joined the lucrative Prophecy job after he lost his business to the activities of fraudsters in lagos and then decided to relocate to Onitsha where he joined the prophesy deal and recruitment of candidates. He however was remorseful on the ground that he was not doing a moral thing. Nwosu chizoba from Umunze equally corroborated all the stories as told by Uchechi peter and Obi Ejike pointing out that she is a mother of one which she begat out of wedlock before joining the business which she initially started at Abuja before moving to Onitsha. Oluwakemi Joy and Kuku Mary, both mothers of four children each and separated from their husbands joined the lucrative business through their friend who linked them to the coordinator.